American SSTO VTOVL orbital launch vehicle. Bono proposal for first step toward VTOVL SSTO vehicle - heavily modified Saturn IVB with plug nozzle engine. AKA: Saturn Application Single Stage to Orbit. Status: Study 1967. Payload: 2,812 kg (6,199 lb). Thrust: 1,232.18 kN (277,005 lbf). Gross mass: 97,887 kg (215,803 lb). Height: 21.00 m (68.00 ft). Diameter: 6.71 m (22.01 ft). Apogee: 185 km (114 mi). The resulting vehicle became known as "Saturn Application Single Stage to Orbit". Notable design features included an aft-mounted liquid oxygen tank to reduce the difference between vehicle center of gravity and center of aerodynamic pressure, and a hydrogen cooling system for the main engine to provide thermal protection during re-entry. Thermal analysis indicated that although the engine itself would be adequately protected by this system, the areas located above the exhaust nozzles would not. Consequently, the designers had to resort to an ablative, expendable material (200 kilograms of Armstrong Insulcork 2760) bonded to the aluminum structure although it would increase the maintenance cost. The oxygen/hydrogen mixture ratio was 6:1 rather than 7:1 since the designers felt a high oxygen ratio would degrade the exhaust velocity and payload capability. 50% hydrogen slush was used to reduce the volume of the fuel tank. The 36-segment plug nozzle propulsion system would have operated at a pressure of 1500psia. It would be used for ascent, orbit insertion, de-orbit and (beginning at an altitude of 760 meters-) the final landing burn. The vehicle would carry enough propellant for hovering for 10 seconds before landing at an unprepared site, if necessary. The estimated landing accuracy of 1853 * 3700 m was not regarded as a major concern since the Gemini 6-12 flights achieved an average touchdown dispersion of only 6.85km although the capsule had essentially no maneuvering capability below 30.5km altitude. The re-entry cross range capability was about +-370km, permitting a safe landing at El Paso, TX or Wendover Range, UT after 2-3 orbits from Cape Canaveral. Wendover was the preferred emergency landing site since SASSTO easily could have been returned from nearby Hill AFB to Cape Canaveral in a "Pregnant Guppy" S-IV-B transport aircraft. 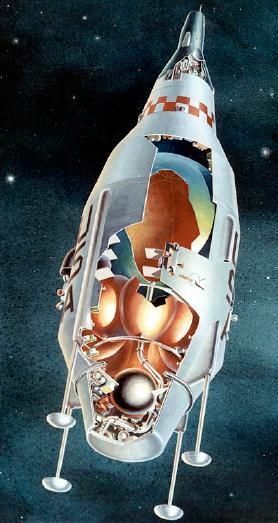 SASSTO had a payload capability of 3,629kg to a 185km orbit and the standard payload would be a 2-man Gemini spacecraft protected by a jettisonable fairing to reduce drag losses during ascent. 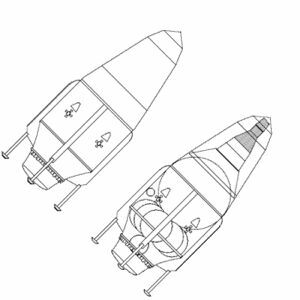 This would provide a safe emergency escape system for the test pilots, and the Gemini ejection seats, heatshield, parachutes etc. (1542kg in all) could later be removed as the flight test program increases confidence in SASSTO reliability. Douglas envisioned this vehicle as a "space fighter" capable of satellite inspection missions, or space station resupply flights lasting a maximum of 48 hours. It could also deliver 2,812kg of liquid hydrogen to a spacecraft in Earth orbit. 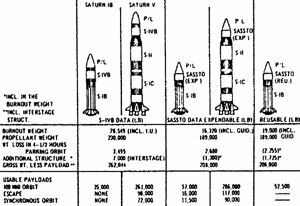 Since SASSTO was loosely based on the Saturn S-IV-B rocket stage, Douglas also proposed an expendable version for use as a more capable upper stage with the Saturn IB and Saturn V launch vehicles. The expendable SASSTO stage would have had a burnout mass of 7,400kg and carried 85,729kg of oxygen+hydrogen propellant. The stage was thus of a much more lightweight construction than the standard S-IV-B (12,949kg + 104,326kg LOX,LH2) and the new aerospike engine would have been more efficient as well (464s specific impulse vs. 426s for the J-2 engine). Consequently, the Saturn V's payload capability would have been boosted by 8-11t as well. The Saturn IB's basic 15876-kilogram payload capability to a 185km orbit would have increased to 23814-25855kg depending on whether SASSTO would be flown in expendable or reusable mode. The latter version was known as SARRA (Saturn Application Retrieval and Rescue Apparatus) and was intended for returning stranded Apollo crews from the lunar surface. Finally, the Douglas design team also compared the cost of SASSTO with two different all-rocket VTHL TSTOs: a winged 1st stage plus lifting-body 2nd stage (center) and winged first and second stages (right). All three vehicles were designed for a 2,812-kilogram payload although the lifting-body TSTO only was able to carry 2,086kg due to center of gravity problems. No attempt was made to estimate the marginal launch cost since there were too many unknown factors. VTVL SSTO would however be expected to yield a significant operational advantage since only a single vehicle must be maintained and the VTVL SSTO does not require a landing runway. SASSTO was expected to cost $1.1. billion to develop (=$5.88B at 1999 rates). The winged VTHL TSTO would cost 2.2 times as much to develop as SASSTO while the smaller lifting-body TSTO variant would be 50% more expensive. The winged and lifting-body 1st unit production costs would be 4 and 2.7 times higher than the SASSTO 1st unit cost, respectively. The general conclusion was that the complex winged or lifting-body TSTO shapes result in added lift-off and manufactured weights of a more expensive construction than ballistic wingless SSTOs. For example, the lifting-body TSTO dry mass (12,274kg + 2,086kg payload) is 2.4 times higher, and the winged TSTO weighs 3.6 times as much (18,176kg+2,812kg P/L) as SASSTO at touchdown. The gross lift-off weights bear the relationships of 1.0 (SASSTO; 97,887kg GLOW), 1.25 (lifting body orbiter TSTO; 122,245kg GLOW) and 1.91 (wing-body orbiter TSTO; 187,020kg GLOW). In that case, is the combination of lower re-entry g-loads, better maneuverability (landing go-around with jet engines) and improved cross range really worth the cost of carrying wings...? Although TSTO thus appears to be uncompetitive vs. ballistic single-stage RLVs for small payloads, the authors admit that requirements for higher payloads (22.68-45.6t) may yield rapid increases in propellant mass fraction for winged two-stage vehicles, making TSTO more performance/cost-effective. 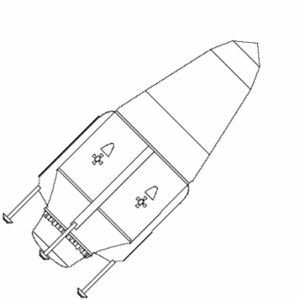 LEO Payload: 2,812 kg (6,199 lb) to a 185 km orbit at 28.00 degrees. Development Cost $: 1,100.000 million. Launch Price $: 0.030 million in 1968 dollars. Flyaway Unit Cost 1985$: 16.100 million in 1968 dollars in 1968 dollars. Stage 1. 1 x SASSTO. Gross Mass: 97,976 kg (216,000 lb). Empty Mass: 6,668 kg (14,700 lb). 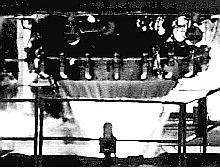 Thrust (vac): 1,558.100 kN (350,275 lbf). Isp: 464 sec. Burn time: 300 sec. Isp(sl): 367 sec. Diameter: 6.60 m (21.60 ft). Span: 6.60 m (21.60 ft). Length: 18.80 m (61.60 ft). Propellants: Lox/LH2. No Engines: 1. Engine: Plug-Nozzle SASSTO. Other designations: Saturn Applications Single Stage to Orbit. Status: Study 1967. Comments: Recoverable S-IVB with plug nozzle engine. 36 x plug-nozzle engines (102 atm chamber pressure, 6:1 mixture ratio). Family: orbital launch vehicle, SSTO. Country: USA. Engines: Plug-Nozzle SASSTO. Stages: SASSTO stage. Agency: Douglas. Bibliography: 36, 514.